As the season reaches its climax, Liverpool participation in the Champions League still looks uncertain. With Arsenal floundering and Manchester United navigating a tough run-in on top of a Europa League campaign, the Reds should be confident of fourth place with a fixture list made up of midtable and relegation-threatened sides. FSG were criticised at the start of the season for failing to provide funds when Liverpool finished the summer transfer window with a positive net spend, with questions over whether there’s any justification for a Premier League team to not invest in its squad when there’s so much money being pumped into teams from television deals, especially one that’s meant to have ambitions of title challenges yet finished eighth the season before. Those criticisms haven’t been assuaged, as a weak squad with little genuine top quality started strongly but fell away as soon as the fixture list got busy and failed to claw their way back. Liverpool should be beating the likes of Crystal Palace, yet as the game loomed a defeat felt inevitable before a ball was even kicked. Both teams started the game in 4-3-3 formations, but their priorities were unsurprisingly different. Sam Allardyce’s side looked to defend first and foremost then hit direct balls into the wide areas in possession, while Liverpool were more patient but had most of their success come down the flanks. In the opening ten minutes, Nathaniel Clyne then Roberto Firmino managed to get in behind the Palace defence after Jeffrey Schlupp stepped up. The Ghanaian was understandably uncomfortable allowing Firmino the space to turn, but as the Brazilian dropped deep to pick up the ball this meant he had to follow him high up the pitch, leaving space to exploit behind him. After getting caught out repeatedly so quickly, Schlupp showed more restraint in stepping out of the defensive line. Firmino still dropped off, but, instead of following him, the left-back would yell at his teammates to pick him up, and could be seen constantly pointing at Firmino throughout the match. Andros Townsend tracked Clyne deep into his half, often forming a back five, however he would be ushered out if Schlupp wanted him to tuck in and keep tabs on Firmino, while Luka Milivojevic was also given a running commentary of the Brazilian’s whereabouts. With this angle of attack closed off, Liverpool’s most successful way of getting at Palace became quick interchanges on the left. The ball being played into Philippe Coutinho’s feet for a first time pass while Georginio Wijnaldum made a run beyond him, with the quick feet and dribbling skills of both men nearly carving out opportunities for Liverpool. Wilfried Zaha didn’t track James Milner as close as Townsend did Clyne, yet despite making some decent runs he rarely seemed to influence the game. With Lucas Leiva dropping between the centre-backs to spread them out across the pitch, it can be assumed that Liverpool’s main build-up was meant to come from the full-backs pushing on. 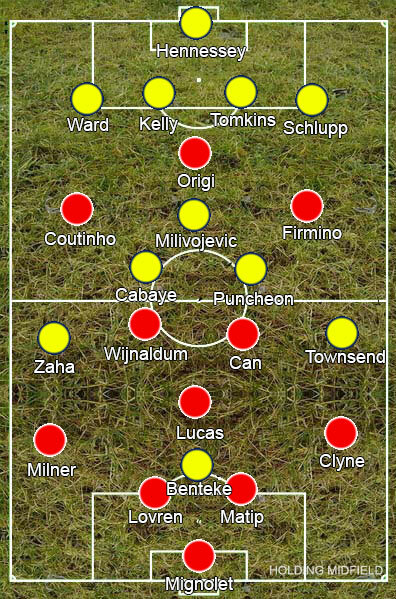 While both are good with the play in front of them, neither Emre Can or Wijnaldum are good at receiving the ball from the defenders so this did make sense, however the main problem came that against Palace’s stacked defence Divock Origi wasn’t going to have much joy from crosses and Liverpool’s two most creative outlets in Coutinho and Firmino were going to struggle to find space to work in. Coutinho moved quickly enough to still look bright, despite also getting fouled whenever he looked like getting free – his fantastic freekick coming from Milivojevic going through him late. To get that space he often had to come deeper though, with Wijnaldum replacing him higher up. This suited both men: Coutinho works well deeper, getting more space to pick balls out over the top or room to run at players and carry it forward, while Wijnaldum can receive the ball on the half-turn wider on the left and find it easier to dribble himself. From the way he let go of Joe Allen despite him being one of the better players of last season, it’s probable that Jurgen Klopp prefers a bigger and stronger player in the middle, nevertheless Coutinho would make a better stopgap while an alternative to the current options is found. The lead should have suited Liverpool: forcing Palace to come out thus giving more space for their nimble attackers to work in. It didn’t. Coutinho did get more space in the middle which allowed him more opportunities to show off his technical ability, although Liverpool did also send more long balls forward. It made sense to test Palace’s backline, especially with their counterpressing making them comparatively well set up to win the second ball, but it also meant they conceded possession more frequently and the game became more end-to-end, giving up their near complete control of the game. Shortly before half-time, Christian Benteke equalised in a goal that will look all too familiar to Liverpool fans. The high line was undone with a simple ball over the top and Yohan Cabaye squared for the Belgian to finish against his old club. The strategies generally continued in the same manner as the first half, although Liverpool were now much quicker at moving the ball forward. Palace then took the lead with another familiar sight for Liverpool fans – Benteke getting a second from a corner. Liverpool are usually alright at clearing the first ball but end up conceding from the second due to problems with their mixed marking scheme, yet here Firmino missed the cross at the near post and the ball went straight through for the Belgian while flat-footed defenders stood gawping. Quite how they manage to look surprised when it happens every week is beyond me. Given the context Liverpool should be embarrassed if they fail to make the Champions League, but given the way the season’s petered out it wouldn’t be a shock. A squad built by a manager who’s made it his life’s work to prove British players can pass just as well as continental players – the team itself evidence he’s wrong – and a copy of Microsoft Excel can only go so far no matter how good a coach Klopp is. This is a team full of players not good enough to really make a difference but not quite bad enough to discard taken above their station by a world class coach and a sprinkle of creativity from Coutinho and Firmino. But when Coutinho finally decides to give up and move to a team showing some semblance of ambition, there will be dubious leaks coming from inside the club about how it’s all his fault, replaced by another “promising” youngster on cheaper wages.